City students meet Rugby World Cup winner Matt Dawson, MBE, in visit to CitySport. 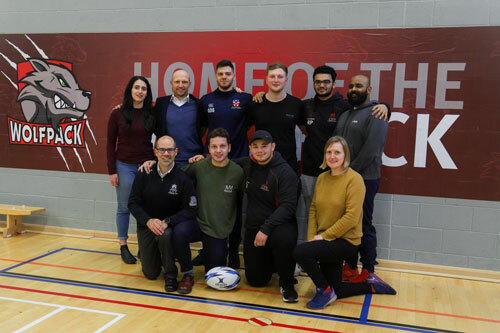 The retired scrumhalf who won the Rugby World Cup with England in 2003, was given a tour of the university and CitySport gym, where he met members of City’s men and women rugby teams, discussing the importance of sport and mental health at university. Matt said: “The sports facilities are very impressive, but more importantly it is great to see them being used. You can have great equipment, but it doesn’t mean much if no one is using them, so to see the CitySport gym busy and the sports hall in use is very encouraging. “Rugby is a terrific sport for companionship, competitiveness, discipline and increasingly the more universities that I visit the more examples I see of sport being used to bond new students as a society as well as a club. Matt visited City as a brand ambassador for Sodexo where he opened Crussh, a new raw juice and smoothie bar on campus. The former England Rugby captain praised the City rugby teams for their approach to mental health, including a video exploring support in the team and encouraged them to keep setting examples for other students. “I think with the reputation that rugby has, being full of people who are very strong and passionate, it is easy to think that they do not have any weaknesses, but that is simply not the case. “It is great that rugby at all levels has realised that if we promote these players who champion mental health awareness, others may look at those perceived stronger characters and feel encouraged to come forward and ask for help when they need it. “I don’t often meet many famous rugby players so it felt very special to be able to talk with a Rugby World Cup winner! I remember watching the final when I was about five year’s old and seeing him on TV in documentaries and sports coverage. “He gave us some great advice on our game, but I mainly took away how he stressed the importance of creating a society rather than just a club. Yasemin Kaya, (LLB Law) and Captain of City Women’s Rugby Team said: “I am quite new to rugby so it was very exciting to meet someone so influential in the game. “It felt really special that he wanted to know about the women’s team as well as the men's team. Our structure is a bit different where we have students from a number of different universities on our team, some of the women we play with have never played rugby before, but it is always fun introducing it to new people.